Each week one of the Salmon University experts answers reader questions in our “Ask a Pro” feature. This week’s questions are answered by Tom Nelson. Submit your own question here. 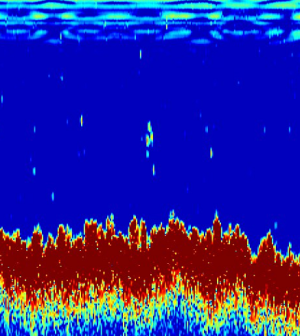 A: Without a hands-on examination of your Lowrance, I would say that – perhaps – you have your sensitivity setting too low, or, your transducer not mounted correctly. You do have to remember, the signal sent down by the transducer is essentially cone-shaped. So, if the fish is outside the cone, you may still catch it but not see it on your screen. However, if you’re seeing no fish at all, you have a different problem. A: The physical changes you describe can take place in both salt and freshwater. It depends on how far the salmon is going up-stream to spawn. For example, salmon in Elliot Bay often take on dark, protective coloring before entering the Duwamish River. Salmon entering the Columbia River, and traveling hundreds of miles up-stream, stay bright until close to their spawning destination. The salmon you caught may have been a lower river spawner. A: Yes, that does delay the spawning trip for Chinook. But, eventually, they will come in to spawn. A: July and August are the best months for sockeye in Lake Washington. However, it hasn’t been open for a season for many years now. As long as gillnets and purse seiners catcher Cedar River sockeye in the San Juans, in and below the locks, in the fish ladder at the locks, and in Lake Union, I doubt you will see a sockeye season for sportsmen. Too bad. That fishery sold more fishing licenses and tackle than the rest of our fisheries in Washington put together. Tom Nelson is the publisher of salmonuniversity.com. Known throughout the Pacific Northwest as the “Dean of Saltwater Fishing,” he has helped develop and test tackle and gear for Scotty, Pro-Troll and Silver Horde, is a regular speaker at area sports shows, has taught more than 5,000 students how to fish during his classes at western Washington community colleges, and is the co-founder of the Puget Sound Anglers.